Days 91-100:Responding to the SEC letter of comment and preparing the amended registration statement. 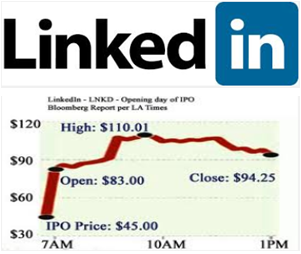 LinkedIn’s rise was the biggest for a newly public Web stock. LinkedIn is one of few foreign social networking companies that can operate in China, where it has about a million users. Many other sites including Twitter, Facebook and Google don’t have a presence in the world’s biggest Internet market. This entry was posted in Linkedin, Public Offering. Bookmark the permalink.